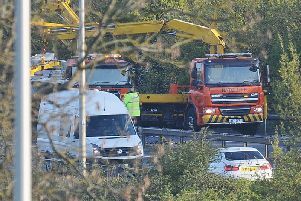 The investigation into the fatal explosion at the Le Maitre firework factory in Peterborough last week is continuing. Dad of one, Brendan Ledgister was killed in the disaster on Tuesday last week. Following the blast, an investigation has been taking place at the factory in Fourth Drove, Fengate, with Cambridgeshire Police, Cambridgeshire Fire and Rescue and the Health and Safety Executive all involved in the probe. A large hole in the roof of the factory can clearly be seen from the road. Investigators in white suits were seen at the site, while the bomb disposal squadron from RAF Wittering were also called to help. The teams have now left the site. A fundraising campaign to help his partner, Chelsey, and eight month old daughter, Olivia, is still running. More than £2,200 has been raised for the young family so far.